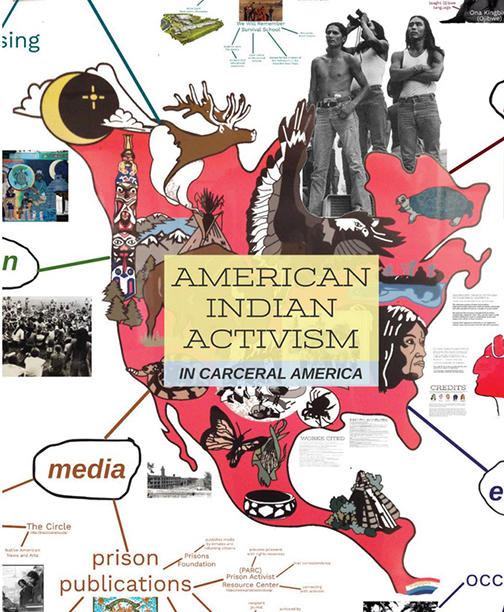 “American Indian Activism in Carceral America” explores the resistance brought forth by Native communities within the Twin Cities and the region of the northern Midwest. Created by Emma Waldie, Bethany Nelson, Natalie Wright, Peter Urban, and Emma Crutcher-McGowan. An unusual collaboration of academic institutions, issues organizations and Native groups has opened a traveling exhibit at the Minnesota History Center in St. Paul that looks at mass incarceration of people in the United States up to the present time. The focus of the exhibit here is on the disproportionate incarceration of Native Americans in Minnesota reaching back to pre-statehood settlement, the U.S.-Dakota War of 1862, the subsequent concentration camp at Fort Snelling and Indian boarding schools. University of Minnesota students engaged in the project note that the United States has the highest mass incarceration rate in the world (2.3 million Americans) and that the imprisoned Native population in Minnesota is 12 times higher than for the white, or dominant population. The free exhibit opened Nov. 20 in the first floor Irvine Gallery in the Center (345 W. Kellogg Blvd.) across I-94 from the State Capitol complex and will run through Feb. 18, 2019. Along the way, partnering groups will hold conversation gatherings for discussions of the lasting impacts of Native incarceration and local programs in place to assist impacted people and their families. Amber Annis, (Cheyenne River Sioux) the inclusion and community engagement specialist for the Minnesota Historical Society and a curator of the exhibit, said the coming together of partners for the exhibit resulted from planning and fortuitous coincidence. Given Minnesota’s history, University of Minnesota students and Minnesota historians wanted to be part of a special Humanities Action Lab coalition of academic institutions led by Rutgers University. “The lab at Rutgers started this. Then, the 20 universities around the country that work with it started adapting the concept to local history,” she said. Annis and University colleagues met for planning at the Pow Wow Grounds coffee shop in Minneapolis. Al Gross, who works at Pow Wow Grounds and holds positions with the American Indian Movement Interpretative Center and with Oyate Hotanin (“Voice of the People”), heard the conversation and “came over and joined in”. “He knew who we needed to reach,” she said. At the reception launching the exhibit, Annis described Gross as “the person who brought us all together” and he, in turn, served as master of ceremonies and introduced other local partners in the exhibit project. The resulting exhibit in St. Paul is localized with historical linkages to the pre- and early statehood quest by settlers for Indian land, the U.S.-Dakota War, and the concentration camp at Fort Snelling that followed. The exhibit also brings public attention to the impact of more recent policies and practices, including the Indian boarding schools and, what Annis called, “the forced assimilation” efforts that have contributed to Native “disassociation” and high rates of imprisonment. The latter is graphically captured by Pine Ridge artist Quinton Maldonado in a collection of what he and the Center call “ledger drawings.” This is an art form created by Native people in captivity and links Native history and Native imprisonment today, the Center explained in exhibit materials. Maldonado said in an artist statement accompanying his work, “Long-term imprisonment is a new phase of historic trauma, breaking up families and eroding balance.” That was a theme in several speakers’ remarks, and most people at the diverse gathering for the opening raised hands when asked if they had family or friends in jails and prisons. The States of Incarceration is a traveling exhibit involving 500 students in 17 states and reflects lingering conditions for Black Americans and other ethnic groups around the country. These groups have shared experiences through Jim Crow laws and forced assimilation in various parts of the country, as noted by Gross and other speakers, but there is no mistaking the Native American experience in Minnesota’s exhibit. Local organizational contributors to the exhibit include Oyate Hotanin, American Indian Prison Project, IN equality, American Indian Interpretative Center, The Circle of Peace Movement, and designer, artist, writer and academic Calee Cecconi. University of Minnesota students and programs involved in the exhibit include the Institute for Advanced Study, the Heritage Studies and Public History program, the Department of History, the Department of American Indian Studies, the School of Architecture, the College of Liberal Arts, University of Minnesota Libraries, and Liberal Arts Technologies and Innovation Services. Nicole Fleetwood, associate professor of American Studies at Rutgers, is scheduled to speak at the University of Minnesota’s Walter Library, 117 Pleasant St. SE, Minneapolis, on Dec. 12, 6-8 p.m., on art by current and former prisoners. Her address, “Marking Time: Art in the Era of Mass Incarceration,” will look at how incarcerated people use limited materials in their artwork. Separately, exhibit partnering groups scheduled special dialogue sessions relating to Native incarceration. The first was on Dec. 1 at the American Indian Movement Interpretative Center (1113 E. Franklin Ave., Minneapolis) where AIM cofounder Clyde Bellecourt and Dakota artist Tom LeBlanc were to lead discussions. Another gathering, “Emerging Leaders,” is scheduled for Tues., Jan 8 at the Minnesota History Center where people impacted by incarceration are to lead discussion on healing, empowerment and leadership. That program is sponsored by University of Minnesota departments, American Indian Incarceration Project and Oyate Hotanin. A fourth program – “Families Impacted by Mass Incarceration” – is schedule for Jan. 29 at the Center for discussion on how incarceration impacts families and communities, focusing on the 10 million U.S. children that have had or are having that experience. A final program, “Reflective Circle,” will be Feb. 5 at the Center for reflective thoughts after viewing the exhibit. Programs at the Center are scheduled from 6-8:30 p.m.
More information on the exhibit can be found at: www.humanitiesactionlab.org. Previous articleWall of Forgotten Natives to move indoors?